The second quarter of 2018 was another busy quarter for Austin's commercial real estate market. Citywide, there was 76,902 sf of absorption and the average rental rates rose to $42.04/sf across the Class A competitive set. Six properties traded hands, including five properties in the Southwest market. There were also ten major leases signed this quarter, including three transactions around or above 200,000 sf. Read on for insights on each of the city’s three major submarkets from our AQUILA leasing experts. Or, to get the full scoop on the city’s office market performance (including these stats and more), download the 2Q 2018 Austin Office Market Report now. Growing up in Austin, the main reason my family would venture into downtown would be for a Saturday morning walk or bike ride around Town Lake. There weren’t as many office buildings (Frost Tower was finished s I left for college), and people didn’t live in the CBD. Fast forward to today, and Austin’s Central Business District is almost unrecognizable. What was once a sleepy central business district no more than 15 years ago is now a vibrant destination for people to live, work and play. Third + Shoal is set to deliver in 4Q 2018; 230,000 sf of the close to 350,000 sf is fully leased to Facebook. Young people are flocking to Austin en masse, many following job offers from major technology employers like Google, Facebook, Amazon and Oracle. While Austin’s office rents and cost of living continue to rise, we are still significantly more affordable than the West Coast alternatives that many of these companies are facing. This cost benefit, coupled with Austin’s perennial “Best Places to Live/Work” mantra has, over the past few years, motivated these employers to not just dip a toe but dive in head first. This past quarter was no different as tenants scrambled to secure space downtown. Many large tenants are increasingly locking down space in new developments before delivery, typically for lack of other options. Indeed, for example, signed a 300,000+ sf lease in the Block 71 development, which is not set to deliver until 2021. 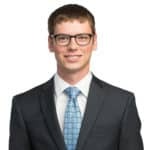 It is easy to conclude that competition for office space downtown must be fierce if pre-leasing three years in advance is necessary to secure a suitable space. WeWork, another important player in the Austin office scene, opened its fourth Austin location with 65,000 sf at Chase Tower, and is already on the search for more space. Aggressive behavior like this continues to drive rental rates in our competitive set up, now reaching an average full-service rate of $63.94/sf. This is up from a rate of $58.64/sf this time last year, a growth rate of 9%. 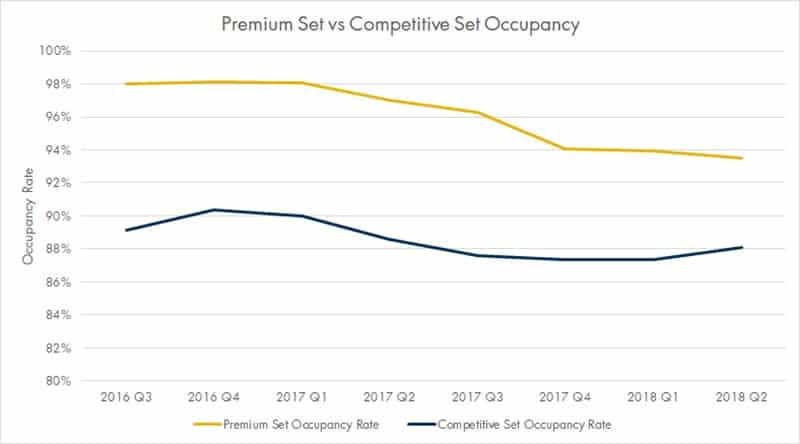 In contrast, rental rates in our Northwest competitive set buildings increased 6% and our Southwest competitive set increased 3.5% over this same period. As Austin continues to develop into a hub for large, established companies looking for big blocks of office space, it will be interesting to see how the CBD compensates. With a vacancy rate of only 7.27% in our competitive set this quarter, the CBD falls well below the 10.7% citywide vacancy rate, and it’s no wonder why developers are chomping at the bit to get in on the action. Multiple new towers are slated for construction but nothing significant with an expected completion date until 2020 (other than fully leased Third + Shoal opening 4Q 2018). Until then, will rental rates continue to increase, and, once delivered, will supply eventually quench demand? Institutions are betting that it will continue to do so as evidenced by a notable sale this quarter. Lincoln Property Company sold 5th & Colorado for $119 million, which comes out to an Austin record setting $664/sf. Once viewed as a secondary or alternative investment market, Austin is now getting the attention of global investors. With uncertainty in the capital markets due to an increased interest rate risk, it will be interesting to see what the future holds for investors in the CBD. I have lived in Austin nearly my entire life, and the city I remember as a child is far different from the booming metropolis we see today. 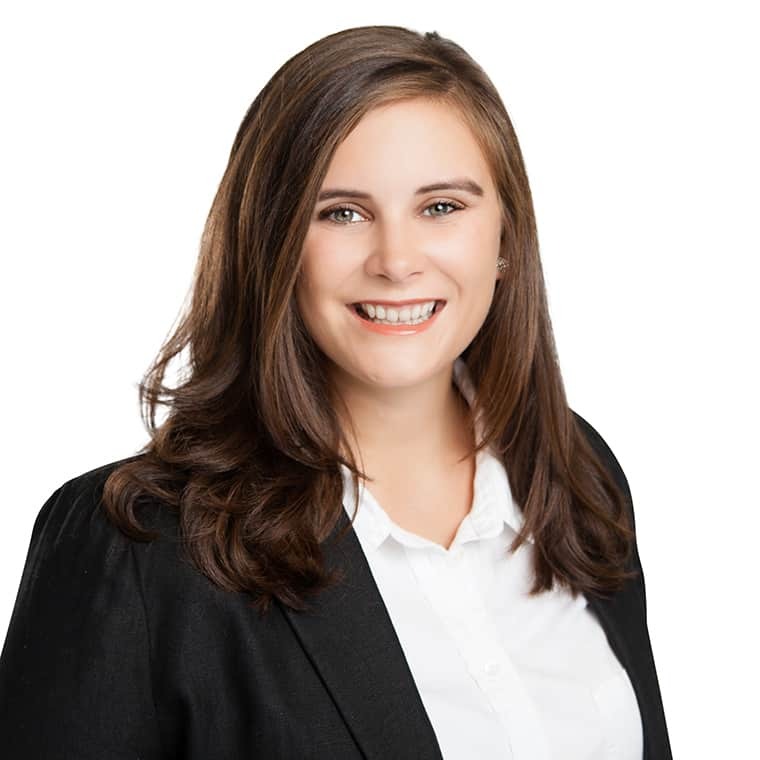 I have been on AQUILA’s tenant representation team for roughly a year and a half, and, in some ways, I’ve had to rediscover the city because so much has evolved over such a short period of time. For the 11th straight quarter rental rates in the Northwest continued an upward trajectory, reaching an average full-service rate of $38.91/sf in our competitive set. The submarket has also experienced an impressive level of positive net absorption, with our Northwest competitive set netting 260,727 sf of positive absorption this quarter. This is despite the 564,863 sf delivered to the market between Mopac Centre and the Charles Schwab Austin Campus. The Broadmoor site now has the potential to contain 6 million sf of development, 3 million sf of which could be office space. The Northwest did not disappoint in large leases either this quarter, with GTT Communications signing a new lease for 44,508 sf at Stonebridge Plaza I. The Northwest has also experienced a couple of large sales, including Bridgepoint I & II trading hands from JPMorgan Chase to Spire Realty Group. The Domain/Arboretum micromarket saw an average full-service rate of $40.34 this quarter. This micromarket has remained the focal point of the Northwest due in large part to the brand name tenants in place such as Facebook, Amazon, WeWork, HomeAway and Indeed. The presence of these corporate giants has had a substantial impact on The Domain, as they continually attract other companies and local businesses to the area. The Domain continues to possess the highest rental rates, lowest vacancy and greatest net rentable area of all the Northwest micromarkets. Although The Domain has held the dominant role in the Northwest for some time, amended zoning for Brandywine’s Broadmoor campus could introduce some competition to the area. 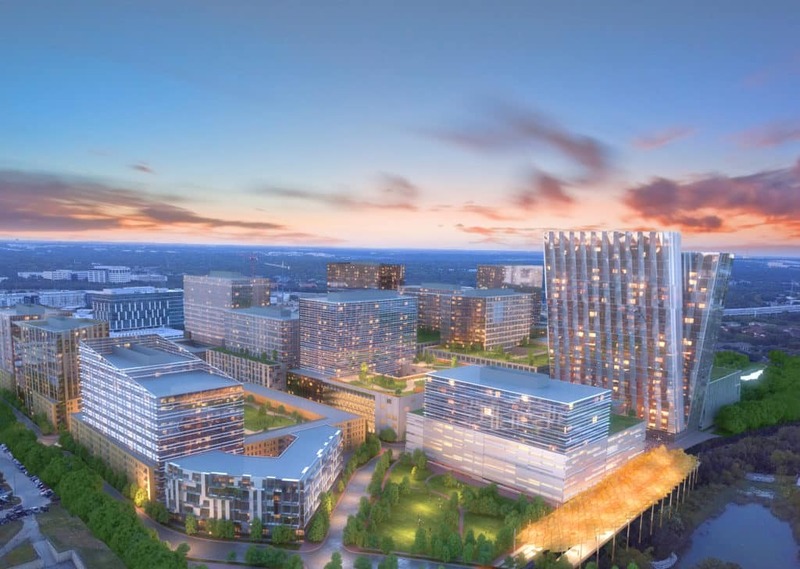 While not completely finalized, the Broadmoor site has the potential to contain 6 million sf of development, 3 million sf of which could be office space. Additionally, the City of Austin’s potential plans for a Major League Soccer Stadium at McKalla Place will also inject a new dynamic into the market. It will be interesting to see how these projects evolve over time, and if the market can sustain enough demand to absorb the additional space. Our Asset Services group at AQUILA currently leases almost 900,000 square feet of existing office space in Southwest Austin – roughly 10% of the competitive set. Anecdotally, we can tell you that we continue to see sustained leasing velocity across the Southwest submarket – the largest drivers of which are organic growth among Southwest tenants and a large inflow of former CBD tenants looking to escape the rapidly-rising full-service rents and increasingly dense environments downtown. Performing exceptionally well are a set of differentiated buildings – those of the highest quality construction in the most desirable and accessible locations. This premium set, composed of buildings at The Terrace, Rollingwood Center, Dimensional Place, Capital Ridge and Barton Skyway, is currently 94% leased and commanding the highest rents in the submarket (the overall Southwest competitive set is nearly 12% vacant). “price-first” market. Users are seeking value and differentiation – although in different ways than tenants downtown. In our 2Q 2018 Austin Office Market Report, you’ll see the latest on rental rates and Q2 capital markets activity – it was a busy quarter for HPI and Brandywine with approximately 1 million sf of sales across the submarket for their two firms. 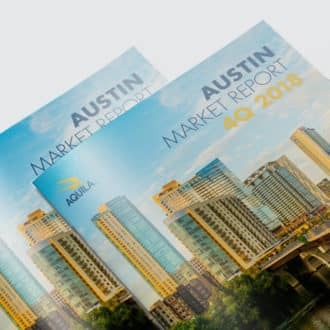 To learn more about the performance of Austin’s three major submarkets, including vacancy rates and rental rates, developments and large availabilities, absorption, and more, download our latest Austin Office Market Report. Get exclusive access to detailed availability skylines for the Southwest and CBD submarkets. Plus, read our special report to learn about pre-leasing trends in the Austin office market and why some tenants choose to lease space years in advance.